Springtime Sports Injuries for Runners: Start Slowly! Save $75 on Excy! The weather is getting nicer, which means so many people will be leaving their treadmills behind in favor of the open road and trails. Whether you are hitting the road for the first time as a new runner or a lifelong runner, make sure to focus on making the transition smooth and injury free to avoid common springtime sports injuries for runners. Doing too much too fast greatly increases your chances of a running injury. Here’s a great article in Shape Magazine to help you get started, “The 3 Injuries You’re Most Likely to Get This Spring.” The article gets into common injuries for runners, including straining the plantar fascia, stiffness in the Achilles tendon, as well patella tendonitis. It also gets into how to prevent these things from happening. As you get started, make sure to recognize the symptoms of overuse injuries, which are generally treated by RICE (Rest, Ice, Compression, and Elevation) + AR (Anti-inflammatory medication and Re-conditioning). 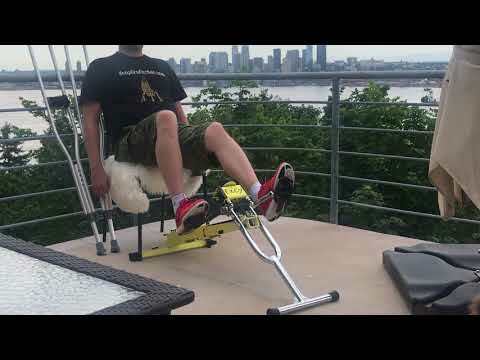 For those who are looking for exercise or rehab products that can help runners prevent injury and / or manage running related injuries, many rehabilitation protocols include riding a stationary exercise bike because the exercise is non-weight bearing and is usually a safe knee rehab exercise to help restore and improve knee joint mobility, stability, flexibility and strength. While people love the benefits of stationary exercise bikes in a clinic or gym, buying it for home use is expensive, takes up a lot of room, and it’s socially isolating for usage in a single room. That’s just no fun when you’d rather be outside in the fresh air! Offering a 14 pound portable stationary exercise bike that folds for easy storage and transport, Excy offers a bold new approach to anytime cycling that eliminates these barriers entirely with a patented approach that helps runners finally connect their prehab, rehabilitation and post rehab cycling to everyday life at home, work, and on the go. From the comfort of a runner’s own coach, lying down on the floor while watching TV, or even at office or on the sidelines of the kid’s sporting events, runners can focus on increasing or restoring knee joint range of movement, joint stability, strength of muscles around the knee, and isolate exercises to help prevent reoccurrence of the injury. 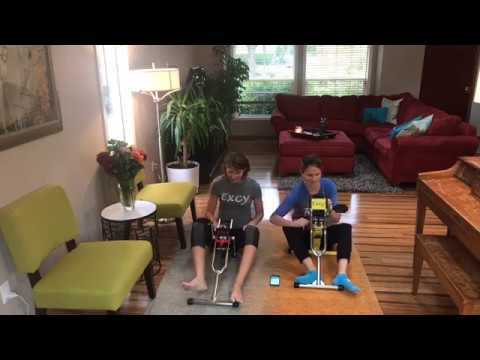 The portable stationary exercise bike works as a recumbent bike, upper body ergometer, floor cycling system while lying down, unicycle, desk cycle and more. 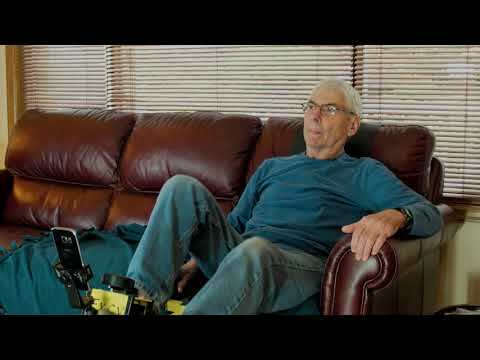 We have 2 – 70 pounds of resistance; so can be used for prefab, rehab, and post rehab to return to play. Our commitment to quality and portability offers better access to make riding an exercise bike dramatically easier, more convenient, productive, safe, and fun when working through common injuries for runners. No clunky gym exercise bike can compete with us on convenience or in dual-purpose functionality for quality upper and lower body cycling workouts anywhere with a single device. Having a mobile coaching platform that serves up on-demand workouts and tracks results puts a cherry on top. 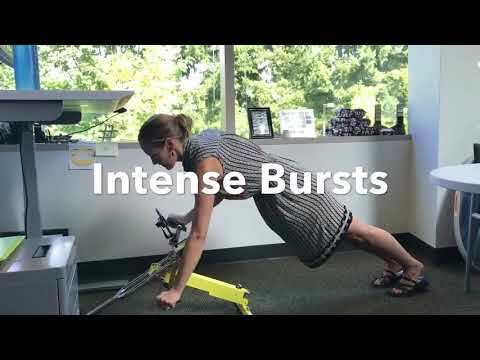 Here are a few quick videos for how Excy customers who are runners use Excy today! Injury is the inevitable side-effect of being a lifelong runner, but it’s essential to return cautiously to avoid further injury. Runner’s World has a great article titled “7 Athletes Reveal How They Manage Chronic Knee Pain—and Still Stay Active.” The article gets into targeted exercises, diet, stretching, foam rollers, ACL surgery and extended rehab, knee replacement surgery, and working with a physical therapist on a little bit of everything to focus on recovery and prevention methods. If your pain alarm repeatedly keeps going off and your brain keeps telling you to do something about it, don’t ignore yourself and consult with your doctor and physical therapist to create a personalized plan that works for you. Use “ExcySpring” at checkout to save $75 on any Excy XCS model to safely cycle yourself strong anywhere!